First things first, I’m going to apologize for the length of this post because it’s a LONG one, friends! I had triple the amount of engagement sessions this year than I did last year which is CRAZY to me! There’s SO much love going around and it makes me so happy! I’ve had the chance to photograph a few familiar faces and meet a bunch of new couples that are truly some of the sweetest and genuine people I’ve ever met!! I am SO honored that I get the privilege to be a part of SO many engagements and capture these people being exactly who they are during the most exciting time in their lives! From the beaches of Indiana, to a coffee shop in Milwaukee, Wisconsin, to the gorgeous views of downtown Chicago, and SO many places in between, these images are some that I will cherish forever! I am so so proud of these photos and I mostly am excited about this blog post so “I” can always look back on! This has been such an incredible year and I thank EACH. AND. EVERY. ONE of you who are in this post! I am SO happy for you and I just love watching your love stories grow and flourish! Some of you are already Mr. & Mrs. (AHHHH YAY!!) and some of you will be celebrating next year! But ALL of you mean so much to me and I can’t thank you all enough for being a part of “MY” story! So without further ado… enjoy some of my all time favorite images from my engagement sessions of 2018! Alexis and Trevor’s session was definitely one of my all time favorites! I can’t even tell you how many times I told her that I wanted like 10 of her outfit! Haha! View more of their Naperville Riverwalk session HERE! Ohhhh Jill and Joe! My cheek bones hurt just thinking about those two! I don’t think I’ve ever laughed as much as I did at their session! These two CRACK me up and are SO perfect for each other in every single way! View more of their session HERE! Marissa and Matt! These two love their country roots and I relate to that so much and I felt RIGHT at home during their session! This girl looked so darn cute in those jeans and boots, I told her she looks just like Carrie Underwood! Haha! View more of their countryside shoot HERE! Lindsey and Dan! This was probably one of my favorite locations I’ve shot at this year! I just LOOOVE this grand iron gate! These two are so sweet and are planning an elegant black and gold wedding right on the water next year that I am SO looking forward to! See more of their Fabian Forest Preserve session HERE! Bridget and Jim! My first wedding couple this year! (view their whimsical wildflower wedding day HERE!) I just adore these two! Bridget is such a sweetheart and the way that Jim loves on her made me want to cry seeing it every time! View more of their Downtown Frankfort session HERE! Lisa and Aaron! Oh my goodness! I had so much fun getting to know these two during their engagement and had a BLAST on their wedding day! I can’t tell you how much I just love these two and their story! View more of their beach engagement session HERE and their gorgeous burgundy fall wedding HERE! Jillian and Zach! I’ve known this girl for quite some time and seeing her so excited to be getting married to her best friend makes me SO happy for her! This was another one of my favorite locations this year!! View her Olivet Nazarene University session HERE! Meagan and Chris! These two brought me to Woodstock to the exact spot where Chris proposed!! 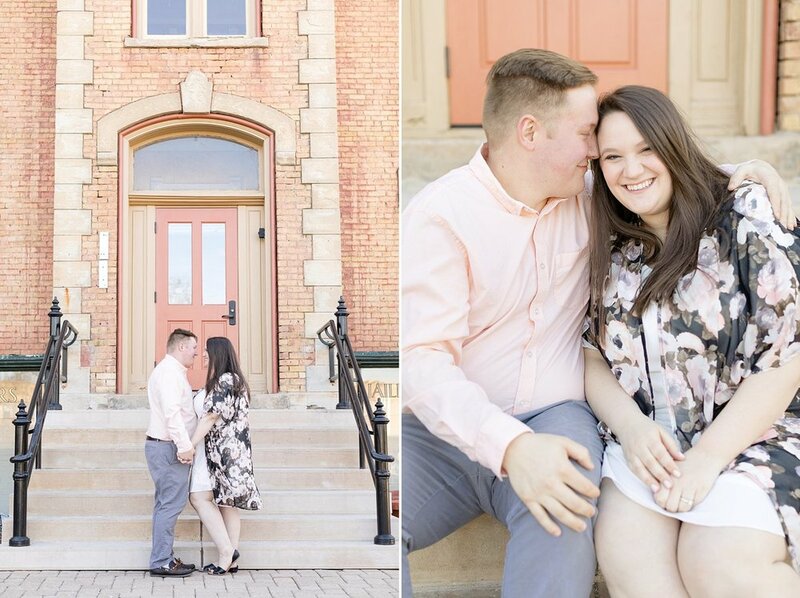 They spend so much time together at the Woodstock Square so they couldn’t image having their engagement photos done anywhere else! They have such caring and loving hearts and I’m SO happy that our paths crossed for me to get a chance to know these two! View their engagement session HERE and see their gorgeous (and hot! haha) summer wedding at The Gardens of Woodstock HERE! Monica and Mike! I COMPLETELY did this on accident by placing these two right after Meagan and Chris but Mike is actually Meagan’s brother! They got engaged a few months after Meagan’s wedding and really enjoyed watching me work! I’m SO thankful that I had their date available and will be serving Mike’s family once again! These two are so down to earth and just such fun people to be around and I LOVED exploring Chicago with them during their engagement session! View more of it HERE! Lisa and Matt! Ohhhhh these two! Some of the most caring people I’ve ever met! I will never forget on HER wedding day, Lisa would always come up to me and make sure that “I” was having a good time and that I was doing okay! The way that Matt looks at Lisa is like he has his whole world right in front of him! Ahhhh! SO sweet! View more of their engagement session HERE and see their amazing country wedding HERE! Stephanie and Dave! 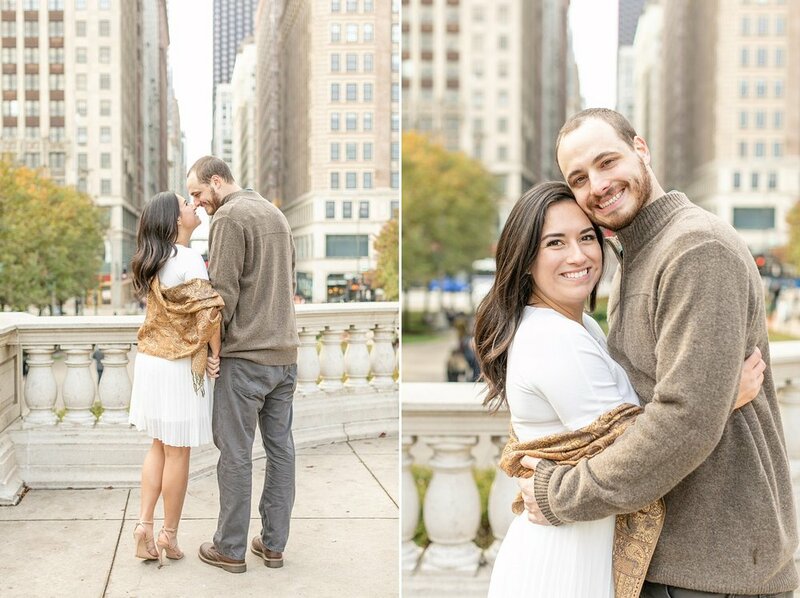 They met in Chicago, fell in love and couldn’t picture their engagement photos anywhere else in the world! Although, doing them in Paris where Dave proposed wouldn’t of been a bad idea at all!! (juss’sayin! haha) They are the cutest couple ever and I can’t wait for their elegant summer wedding next year which will be right here in sweet home Chicago! View more of their session HERE! Anna and Leo! Not only was she one of my brides, but also one of my very good friends! Anna is the most thoughtful, considerate and humble person I have honestly ever met. Being super close with her allowed me to be a big part in her wedding planning and the day I met Leo (at their engagement session) I just KNEW these two were each others “person”! He also shares a love for macarons which I LOVE about him! Haha! These two will forever hold a special place in my heart! View more of their coffee shop engagement session HERE and their stunning lakeside wedding day HERE! Jamie and Jake! The definition of gentle love. I just LOVE LOVE LOVE these two! It was so special to be a part of Jamie’s engagement and wedding day! (view their rustic and romantic wedding day HERE!) Me and her go way back. Like, back to riding the same bus to school! I also photographed her senior session YEARS ago! I was absolutely honored to be their wedding photographer and I am obsessed with everything we captured together during their wildflower field engagement session! View more HERE! Kayla and Brandon! Ahhhh! We share the same wedding day and there isn’t anyone I would want to share that date with! These two are planning a lakeside October wedding next year at an AMAZING venue on the water and I can’t wait!! View more of their downtown Chicago engagement session HERE! Allie and Mike! These two are SO much fun! And so goofy together! We explored the Kankakee River State Park and I just loved getting to know these two sweet people! They had the most crazy weather on their wedding day (view their wedding HERE) and after how much fun we had on their engagement session (view more HERE) , I went into their big day knowing it was going to be amazing! Brieanna and Nick! These Jr. High sweet hearts have been waiting for SO LONG to finally be married to one another and they will finally be saying I DO at the end of December! 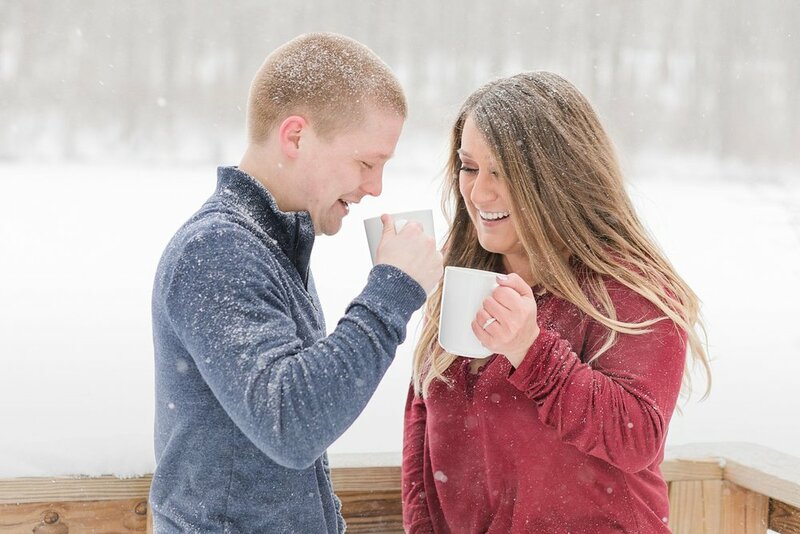 Their snowy engagement session was definitely one of my absolute favorites! They braved the cold and SNOW with me to make this session happen and I LOVE everything we captured together! View more of their session HERE! Jamie and Corey! My pumpkin patch cuties! When she said that she wanted to have her engagement session done at a pumpkin patch, my fall loving heart SCREAMED yes, please! They are planning a fall wedding for next year that will be covered in pumpkins, lanterns, hay bales and everything FALL you can imagine! I can’t wait for these two to me married!!! View more of their pumpkin patch session HERE! Jessica and Camren! 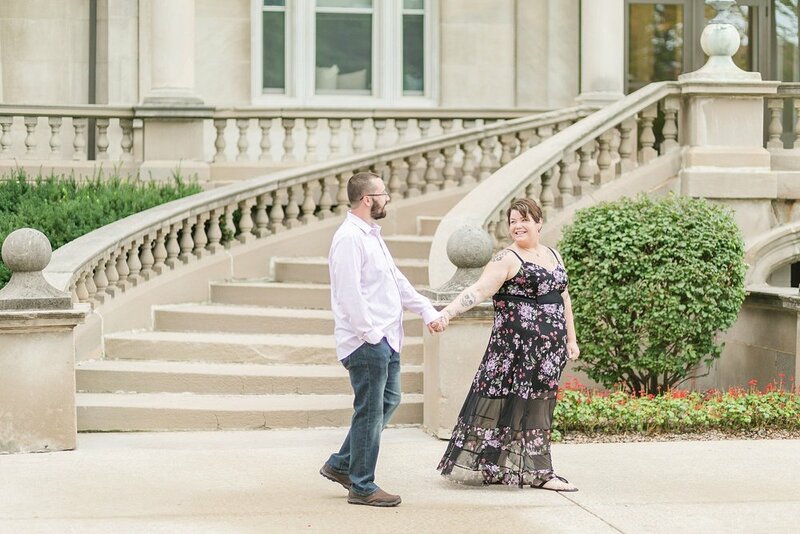 My very first engagement session of this year! It was January, it was 18 degrees out, but these two didn’t care one bit! They were so wrapped up in each other that no one could tell it was so cold! They were SO cute! See more of their session HERE! Brittany and Nick! When they asked if their sweet pup Zoey could come along for their shoot, how could I dare say no? We both have dogs named Zoey so that made us best friends! Haha! 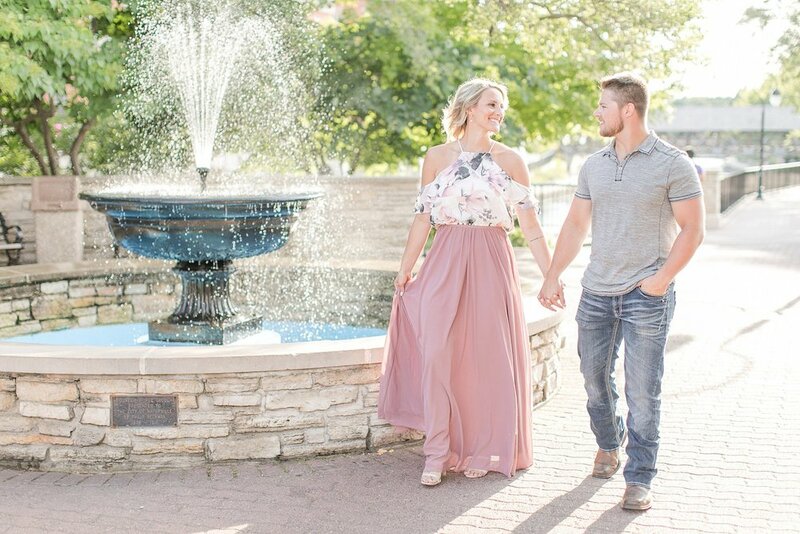 They wanted a rustic and country vibe for their engagement session and I think we hit some pretty good spots! View more of their session HERE! They also had the most beautiful navy and blush fall wedding at one of my new FAVORITE venues this past November! View their wedding day HERE! Becca and Josh! We played in the corn fields and had the LAST bit of fall colors for their engagement session and I loved everything about it! They are planning a fall wedding for next year and from all the details she’s told me about, it’s going to be absolutely beautiful! View more of their countryside engagement session HERE! Mariana and Seth! Ohhhh my goodness! 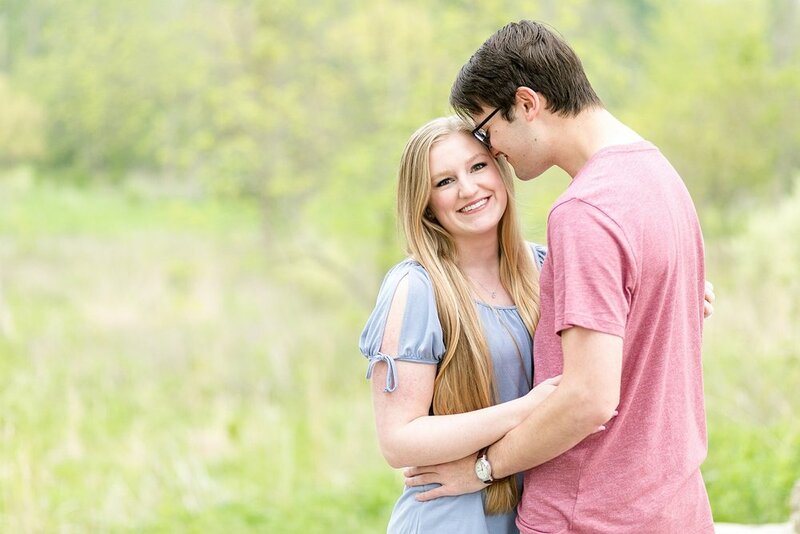 These two are SO SO sweet and the very location that they will be getting married is very special to me! It is the exact place where “I” got married last year! UGH! I will be a big ball of emotions on their wedding day that I am SO looking forward to! View more of their Milwaukee engagement session HERE! Paige and JD! Boyyy these two love their mustangs! I get so excited when couples bring props or special things to their engagement sessions that mean something to them but I was NOT expecting this one! We had so much fun getting creative with their cars and you can see more from their session HERE!